Right Blend Investing, LLC (RBI) is a Registered Investment Advisor in the state of New Jersey. RBI is an independent firm, and is wholly owned by Robert J. Martorana, CFA. RBI is a fee-based firm, and it operates as a fiduciary. It is organized to serve the best interests of clients, and the investment professionals at RBI are held to the Code of Ethics and Professional Standards created by the CFA Institute. 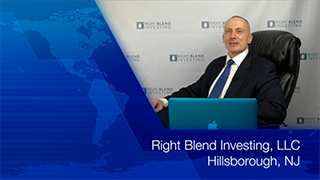 Right Blend Investing offers objective investment advice that is customized for each client. This drives all of the products and services we offer, and it is built into our business model. First, we offer objectivity. All fund managers claim to be objective, but this claim needs to be supported by the firm’s business model. For example, a firm that is paid by commission will tend to trade actively, whether or not this is in the client’s best interest. The compensation at Right Blend Investing is designed to minimize conflicts of interest and maximize the value we offer each client. We are paid by our clients in different ways, as discussed below. But all of these methods are designed to provide objective advice for the benefit of our clients. 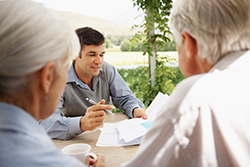 Compensation affects all types of financial advice, especially investment management. 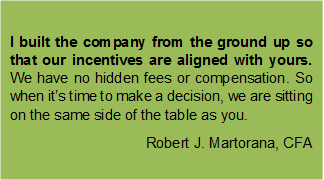 So we believe it is critical to discuss not only the level of compensation, but also the structure of compensation. Second, we offer customization. Our business model allows us to serve individual clients with the compensation structure that makes the most sense for them. Clients choose how to pay, depending on what services they need. Some clients will choose to pay a percentage of assets under management; other clients will choose a package of services at a fixed price; and others will choose consultations at hourly rates. Right Blend Investing allows the client to choose any of these compensation structures, alone or in combination, at a rate that is in line our peers in the industry. By allowing our clients to choose the compensation structure that fits their needs, Right Blend Investing can offer both objectivity and customization.